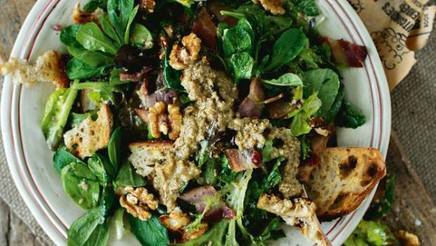 Made of nuts, Bacon, and bread this is a version of the classic salade aux noix. The French would serve it at the end of a meal, separately in order to savor the flavors, but it makes an excellent entrée. The walnut vinaigrette is wildly good – make more than you need as it's delicious on roasted vegetables too.